Eileen Myles joins us to kick off The Transparent Symposium, a two-day program bringing together scholars, writers, and critics to discuss all things Transparent (Amazon, 2014) and engage in dialogues at the nexus of Sexuality and Gender Studies, Jewish Studies, Religious Studies, and Media Studies. 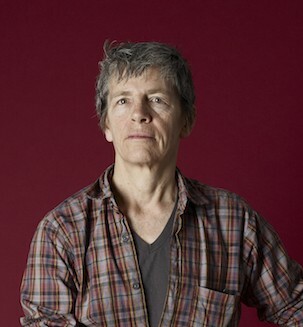 A critically-acclaimed author, Eileen Myles served as a consultant for Transparent during the development of Leslie Mackinaw, a character whose persona was inspired by Myles' life and work. Transparent also featured Myles' poetry in several episodes of Season Two. Myles is the author of nineteen books including I Must Be Living Twice: New & Selected Poems (2015) and the cult classic Chelsea Girls (1994). Their next memoir, Afterglow, is forthcoming (April 2017). They are the recipient of a Guggenheim Fellowship in non-fiction, an Andy Warhol/Creative Capital art writers' grant, a Lambda Book Award, the Shelley Prize from The Poetry Society of America, and has been named to the Slate/Whiting Second Novel List. They currently teach at NYU and Naropa University and live in Marfa, Texas and New York.